Landscape design is the art of landscaping. You should start with the planning of the site, it is important to find the right place garden plantings, lawns, flower beds. - Chinese – naturalness, simplicity and harmony are the main pillars of this style. landscape or English – he assumes a natural position of the elements. When choosing a style, we should use the feature and characteristics of the site and their own taste. 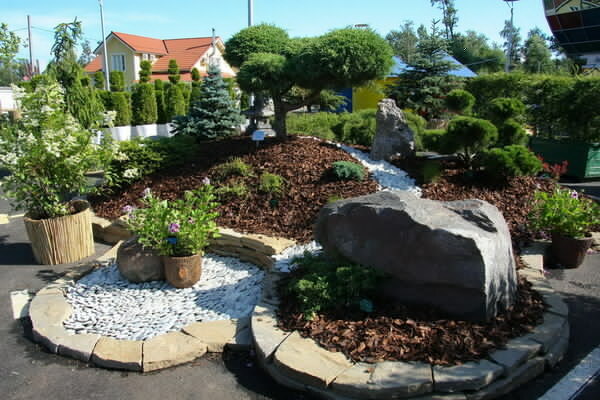 With some small effort, you can create an original landscape design with their hands. The easiest way to elevate a site is to plant as soil covering plants and put purchase rolling lawns. Affordable lawns of fescue and bluegrass look great, do not require complex care. To maintain the lawn in good condition, plenty of regular watering and mowing. To create a decorative green cover are used as soil covering of plants. Low-growing flowering perennials make out ridges, borders, Alpine slides. They have not only a decorative function, but also retain the ground moisture, and allowed to germinate weeds. No matter how beautiful the lawn, no flower beds, the plot of faceless and boring, the adornment of any garden is the flower garden. To make the colors pleasing to the eye from spring to autumn, it is necessary to choose the right range. Under trees you can grow primroses that will have time to wither before the leaves will cover the sun. Along the fence will feel climbing plants – sweet peas, ornamental beans. In well-lit areas grow annuals, dried flowers, perennial irises, roses, carnations. Phlox, astilbe, lilies, fuchsias grow well in soils with closely spaced groundwater. On the barren land with rocky soil it is possible to arrange the Alpine slide. The bottom is decorated with undemanding plants such as creeping thyme, Edelweiss, perennial carnations. The middle tier is decorated with sedums, Kamenolomni, Astra alrisha. Complete the composition of drought-resistant plants – bloodroot, iberis evergreen.